There is information available today via the internet. Some of it has not been published until now because has threatened the belief systems of most editors and their readers. Some of this information has been available to a limited few, but they were only briefly exposed to it. Therefore, this website is composed of copyrighted material which should be more widely published in an effort to educate the vast majority who have either no conception, a limited conception, or a completely erroneous idea of the subject matter. Most of the information is found in the form of old books or articles which are timeless in nature, so they are as valid today as they were when they were written. The author or authors will not be mentioned by name as they have moved on to other pursuits and do not wish to be involved now. Some of the readers will, no doubt, recognize who they are. Before moving on, the reader should be aware of the following. 1. The people of prehistory and early history were much more knowledgeable than most of our learned people today will admit. Much of the old knowledge has not been lost, but is available when one knows where to look for it. However, this knowledge is not likely to be comforting to those who do not wish to make the effort required by thinking. 2. The Hebrew from which the first translations of the Old Testament of the Holy Bible was taken is in a code language that could not be and may never be correctly translated into English. 3. Each ancient civilization had a form of what we call astrology which was so deeply ingrained in their religion, myth, and science that the students of such a civilization cannot hope to understand that culture unless they carefully study astrology. Astrology, however, is an old Greek word which means study of the stars and is, therefore, an incorrect label. The Greeks were late-comers and had a diluted and sometimes erroneous knowledge of this old science which they borrowed from older civilizations. Astrology is not, for the most part, a study of the stars. Unfortunately, popular astrology today is even worse than the astrology of the old Greeks and further confuses the issue. Of course, there are some good astrologers today, both amateur and professional, who use the old science correctly. 4. Ancient astrology was a study and application of the influence of the planets, and is based upon a seasonal zodiac which uses the stars merely as references. This astrology was not a form of fortune-telling. It was more like a weather forecast allowing one to choose whether or not to carry one's umbrella before going out. Due to the law of averages, it was a better aid for predicting the future of large trends in the world than for predicting individual fortunes. 5. The scientists of these ancient civilizations knew that the earth is a sphere, that the planets orbit the sun, that stars are other suns, and that there is precession of the equinoxes. 6. The old scientists seem to have known that there is an infinite inertial reference frame in which we exist in our universe. 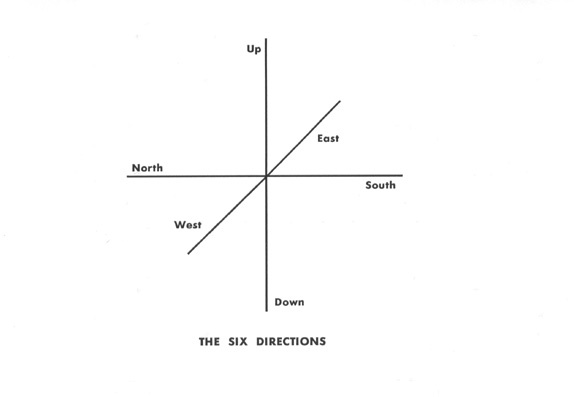 This is evident because they believed there to be an infinite distance in six directions with each of us a center. Since each direction was infinite, all were equal to one another and every point in the universe was considered a center. This is similar to our view today of three dimensions of space. However, the old scientists went much farther than that. 7. The scientists of these ancient civilizations had a system of mathematics advanced enough that they could do what our quadratic equation does today. Their knowledge of global navigation rivals our own. Much of their math and coding was and is beyond what we have been taught in our modern schools. Some their knowledge of physics was and is well beyond our knowledge of physics today. Their knowledge of psychology dwarfs our feeble efforts. We are only beginning to discover their advanced methods of teaching. 8. There are many reasons to believe that humans have had very advanced civilizations before recorded history, and that certain people have kept the old secrets so that we could become educated and begin again after each cataclysm. However, this process of education is always retarded by our own greed, suspicion, and mental laziness. 9. The average person resists the learning/thinking process to such an extent that he or she would rather kill the messenger than learn from him. Consequently, much of the old knowledge is kept by those who remain "underground", and only a little bit of this knowledge is leaked out with each generation.